Humanized αCD122 synergizes with belatacept to inhibit alloreactivity and prolong NHP transplant survival. (A) MLR of NHP PBMCs between fully MHC-mismatched pairs. CFSE-labeled responder lymphocytes were incubated for 96 hours with irradiated stimulators (culture), with IL-15, IL-15+bela (belatacept), or IL-15+bela+αCD122. The addition of belatacept alone did not suppress proliferation, effector function, or loss of CD28 expression. 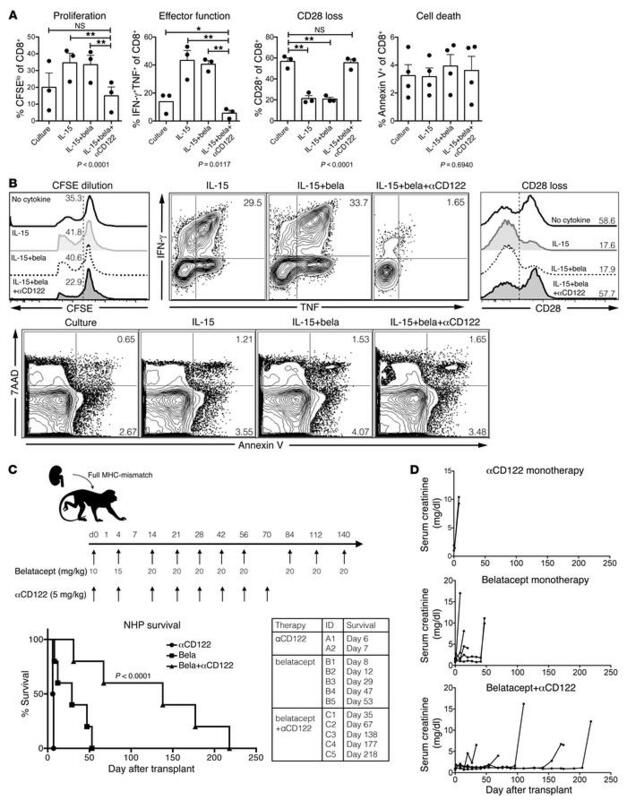 The combination of bela+αCD122 reduced proliferation (P < 0.0001), diminished effector function (P = 0.0117), and restored CD28 expression on CD8+ T cells to similar levels as culture conditions without IL-15 (P = 0.8011). (B) Representative FACS plots of CD8+ T cell expansion by CFSE dilution, effector function as measured by dual IFN-γ and TNF production, and apoptosis and cell death as measured by 7-AAD and Annexin V staining (corresponds to graphs in A). (C) NHPs underwent bilateral nephrectomy and life-sustaining renal transplantation from a fully MHC-mismatched NHP donor. Animals were treated with humanized αCD122 alone (5 mg/kg, black circles, n = 2, MST = 7 days), belatacept alone (black squares, n = 5, MST = 29 days), or bela+αCD122 (black triangles, n = 5, MST = 138 days, P < 0.0001, Mantel-Cox log-rank test). Combination bela+αCD122 synergized to prolong NHP survival compared with belatacept monotherapy, or αCD122 monotherapy. (D) Corresponding serum creatinine curves of NHPs and demonstrated rejection were preceded by declining graft function. (A–B) P values were generated by repeat measures 1-way ANOVA and Tukey’s multiple comparisons test; bars represent the mean ± SEM of 3 NHPs per group. In vitro results are representative of 3 independent experiments. *P < 0.05; **P < 0.01.